We've pulled back the curtain on the healthcare industry. Never overpay for healthcare services again. We're a healthcare consumer advocacy association dedicated to helping our members find the best healthcare solutions, with the highest possible doctor and hospital ratings, all delivered at the best possible pricing by your own, personal healthcare consultant. Shopping online for TV's, cars and clothing is second nature these days. 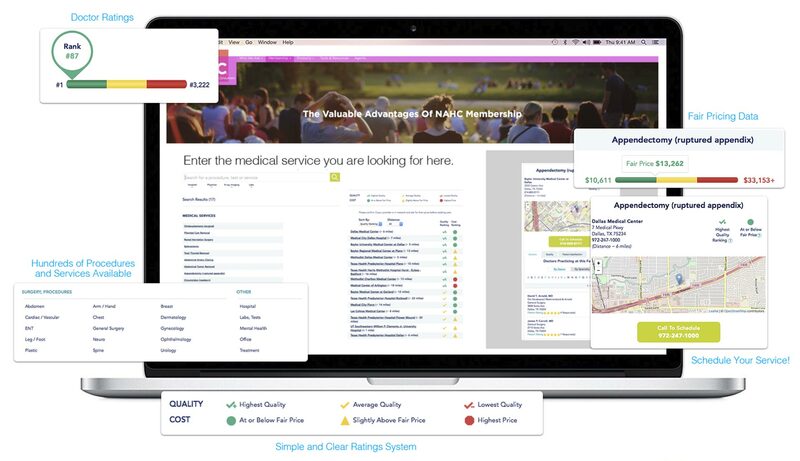 Wouldn't it be great if you could do the same to find the best possible healthcare services? Now you can with our simple to use memberships. Your NAHC Membership provides access to reviews, reports, doctor ratings and so much more which will ensure you’re able to engage the nation’s top rated and most reputable healthcare providers. With NAHC, you now have your own healthcare concierge Advocate who will collaborate with you, one-on-one, to make sure your best interests are always protected. And in healthcare, that is huge! You already comparison shop for clothing, TV's and other life necessities...why not healthcare? Our world has changed, and we've introduced the most comprehensive method for locating, comparing and learning about the best possible healthcare services at the best possible prices around. All in one place with an affordable membership! You can now search in your area for medical services by price and doctor quality ratings. Even each facility receives documented ratings that are held to the highest standards. Our database is second to none and completely accurate. ​ And this is just one of many tools you'll have at your disposal. Memberships that deliver big time. A membership to anything is only as good as the benefits it offers. Make no mistake, with NAHC, you'll now have access to premium services in healthcare unlike anything you have seen before, and a personal advocate assisting you with it all! Finally, a place to save on all your out-of-pocket expenses with powerful products. Say goodbye to the days of the "pricing cram down" from providers. Get the most experienced doctors at the lowest prices. Dentists, Optometrists, Surgeons, Therapists...our memberships cover every possible healthcare need you could ever need. Guarantee Trust Life Insurance Company (GTL), Reliance Standard Life Insurance Company (RSLI) and Vision Service Plan (VSP) are separate legal entities and have sole financial responsibility for their own products. Your new single source for every healthcare need you face, with support from your own consultant!